You are here: Home / Health / Protecting Those Pearly Whites: All About Tooth Enamel Erosion. Protecting Those Pearly Whites: All About Tooth Enamel Erosion. 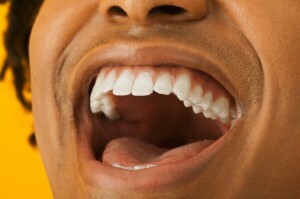 (ThyBlackMan.com) Tooth enamel is the hard outer layer on teeth that protects them from wear and tear. It is an incredibly strong substance. In fact, it is the strongest substance in our bodies. However, it can still become damaged with relative ease through regular acid attacks caused by food and drink. Enamel protects the dentine underneath, and when dentine becomes exposed it can become painful or sensitive. You may find that your teeth become sensitive to heat or cold and other problems like decay and cavities can affect your teeth. So what do you need to know about tooth enamel erosion to ensure your teeth stay strong and healthy? There are many possible causes of erosion, some of which are more common than others. Eating too many sweet foods can be a common cause of erosion. The bacteria in your mouth love sugar, and they feed off it and create acids that erode the tooth enamel. Other foods and drinks are also a major cause of erosion. These include candies, sour foods, fizzy drinks and sodas. Some types of fruit also contain natural acids, especially citrus fruits like oranges and lemons, and fruit juices can also be acidic. Brushing your teeth too hard can be problematic. When enamel is affected by acids, it softens. If you brush your teeth too soon after eating while the enamel is still soft, and you brush too hard or by using a toothbrush with hard bristles, this can cause damage. Vomit can cause damage to teeth due to the acids it contains. People with conditions such as bulimia who vomit often may find that their teeth are more affected by enamel erosion. In the same way, conditions that bring acids into the mouth, including heartburn and acid reflux disease, can cause problems. There are a number of signs that you can look out for that can indicate a problem with your tooth enamel. One of the most common is a pain or sensitivity in your teeth, especially when eating sweet food, drinks, or hot or cold food. Dentine is darker and more yellow that enamel, so if you notice that your teeth are yellowing, this could also indicate a problem with erosion of enamel. Sometimes the edges of the teeth may become rough and can even chip due to a loss of enamel. You may also spot dents in the teeth, and none of these signs should be ignored. If you suspect that your teeth are suffering from enamel erosion, make sure you visit your dentist as soon as possible. Book an appointment with a trained specialist such as Winnipeg Orthodontists, and they will help to resolve the problem. Treatment may include bonding, which can protect teeth that have become worn down or chipped. If a greater amount of damage has been caused, a veneer or crown may be used instead. It is always best to reduce the risk of tooth enamel erosion in the first place. One of the best ways to do this is to ensure good oral health, which includes brushing your teeth with fluoride paste twice a day and visiting the dentist once every six months. When you brush your teeth, avoid brushing too hard and always wait until an hour or longer after eating acidic food or drink to avoid damaging enamel that has become soft. Acidic food and drink is a major cause of tooth enamel erosion, so be careful about drinking fruit juice, soda, and citrus fruits, as well as eating sweet and sour foods, or foods that contain vinegar such as pickles. You do not have to avoid them completely, but try to enjoy these foods at mealtimes because this will help to avoid damaging the enamel. You can also rinse your mouth with water after eating something acidic. Milk and cheese are particularly good because they are not acidic. You may want to end a meal by drinking milk or eating cheese to restore balance in your mouth. Also be careful about how you drink. Rather than swishing drinks around in your mouth, try to avoid contact with your teeth as much as possible. This may involve using a straw instead. You may also want to chew gum after eating a meal. Choose a sugar-free gum, and this will help to lower acid in the mouth. It also assists the production of saliva, which is good for strengthening your teeth and restoring balance after eating acidic foods. Tooth enamel erosion can cause serious discomfort, so it is always best to try and prevent it by using the above tips. If you notice that your teeth are becoming more sensitive, or you spot any of the other warning signs of enamel erosion, visit your dentist for a check-up so that they can advise you on your best course of action. Dr. Bruce Bohunicky is an alumni of the University of Manitoba Faculty of Dentistry and brings a wide range of experience in general dentistry. A life-long learner with a penchant to provide the best possible care, he consistently upgrades his skills with advanced post graduate courses and training with some of the top dentists in the world. These are some great tips, and I appreciate your advice to visit your dentist as soon as you can if you think your enamel is eroding. My teeth have been yellowing, and they have been more sensitive to extreme temperatures lately. I’ll definitely look into visiting my dentist right away to treat me for enamel erosion. Thanks for the great post!